Definition - What does Anjali Mudra mean? Anjali mudra, one of the hand gestures of yoga, is a common way of greeting in most Asian countries. Yoga also uses anjali mudra as it is associated with spirituality and aids in meditation. Anjali is a Sanskrit word which means "salutation" or "to offer," and mudra means "seal" or "gesture." Therefore, anjali mudra translates as "salutation seal" in English. To begin, the yogi enters sukhasana, or easy pose. Bringing the hands together, the palms are placed gently against one another in front of the anahata (heart) chakra. The fingers point upward. The spine is lengthened while sitting comfortably straight. Bringing the hands together in such a way while saying "Namaste" is a respectful greeting. 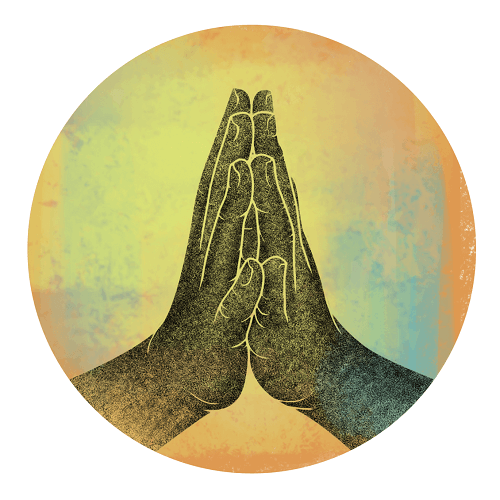 In the yoga community, classes often conclude with this mudra while chanting Om as a way to seal the practice and honor one's self and fellow yogis. Apart from sukhasana, anjali mudra is also used in poses including tadasana and vrksasana. The hand gesture is also assumed while beginning a Sun Salutation. Placing the hands and palms in a particular way, as in a mudra, regulates the flow of energy and redirects it to a particular area of the body, depedning on the mudra assumed.